If you're in the U.S. and are as infuriated about the plan to slash all funding for Planned Parenthood as I am, I encourage you to contact your representatives. It's as easy as making a call and leaving a message with their voicemail or staff that you want to see Planned Parenthood funded. Planned Parenthood performs such important services. Even if you aren't pro-choice, you have to believe that health screenings, medical care, and pre- and post-natal care for impoverished women and children are essential. I turned to the local Planned Parenthood as a broke college student. They got me into the habit of regular check-ups and provided discounted birth control for me and many of my friends. They were a useful resource and enabled us to grow up wiser and healthier and have children when it made good sense. 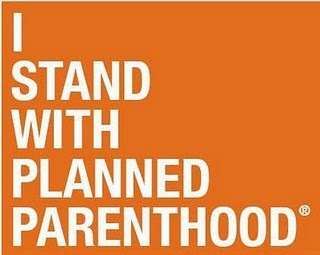 For a guide of what you can do to stand with planned Parenthood, visit the Planned Parenthood Action Center. If we don't speak up for what we believe in no one will do it for us.